When talking about Damon Evans at his introductory press conference Tuesday there was one term that just kept coming up. “He’s really confident. And when we’re confident in what we do it’s easy to be great,” said Terps field hockey coach Missy Meharg, who also was a member of the search committee in charge of finding the University of Maryland’s new Athletic Director. “I am confident that we have found the right person for the right time to lead Maryland Athletics,” added school president Wallace D. Loh. 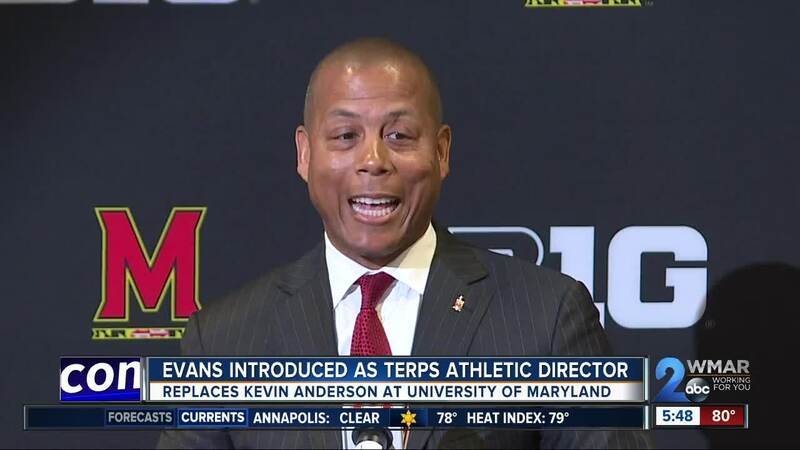 Evans, 48, was introduced as Maryland’s new A.D. Tuesday morning at The Hotel in College Park. Evans had been serving as acting athletic director since former A.D. Kevin Anderson left for a sabbatical last fall. Anderson resigned in April. He hired Evans as senior associate A.D. in 2014. This is Evans’ second chance at an A.D. job. He served in that role at Georgia but resigned in 2010 after being charged with DUI. “My journey has been long. A journey is about growth. I’m not through growing. I’m not through learning. I’m not through changing,” he said. Evans choked up when talking about his staff that he said never gave up on him. Looming over Terps athletics is the death of football player Jordan McNair. The Randallstown resident passed away on June 13 at the age of 19. He died two weeks after collapsing during a team workout. Loh said the compassion Evans showed while McNair was hospitalized is part of why he was hired. “Days and nights at Shock Trauma consoling the players, talking to the doctors and to the parents. Those are important qualities in any leader,” said the UMD President. The school is conducting an external review to evaluate protocols surrounding McNair’s death. Evans said it’s expected to be completed in about 90 days.